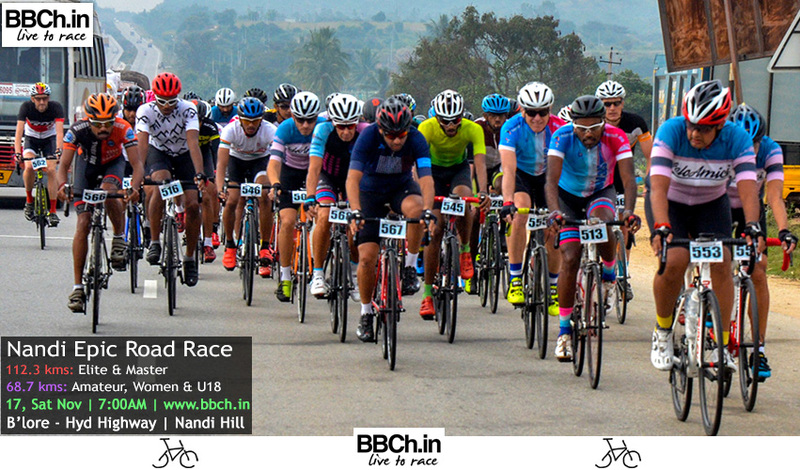 The last road race of the awesome Bangalore Bicycle Championships 2018 season is going with a Nandi Epic 112.3km & 68.7Km Road Race on NH-7 Bangalore - Hydrabad Highway. 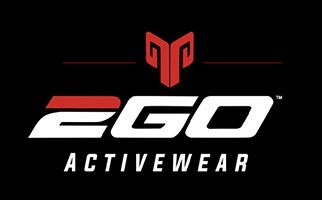 Non-Road Bike Category is for only non-road bikers. Cyclist can use hybrid, MTB, Foldie. Note: Fixie and single speed Bike is not allowed. Masters category is for anybody who is above 40 years of age irrespective of gender. The race will start at 7AM. Get to the venue at 5:30AM. Make sure you pre-register and digitally sign your indemnity form online, so you just have to collect your bib numbers on race day. 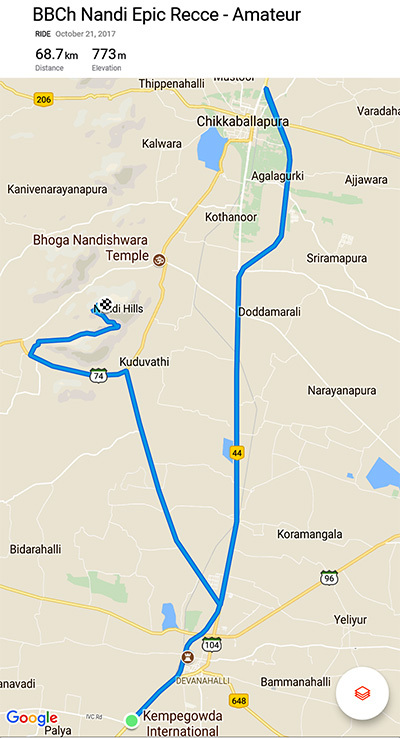 The start will be a little past the Airport toll gate and finish will be a Nandi Hill Gate. Race HQ is 4 km from the airport toll gate. 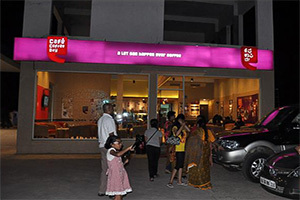 Take a U-turn for Cafe Coffee Day and HP petrol bunk where bib collection, pre-race briefing and staging will take place. Podium will be at Nandi base by 12:00 PM. The race rolls north on NH-7, past a couple intersections that will be marshaled. 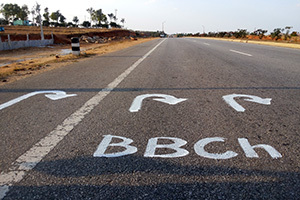 After 48.5 km of rolling terrain, some really long flyovers, exposed highway, and south-westerly crosswinds to deal with, the race "descends" 8 km, on straight and fast highway, to the U-turn point. The U-turn will be marshaled and will have a neutral feed station. The first challenge of the course is the 8 km of highway climbs from the U-turn point. 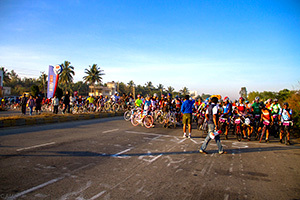 Once that is behind you, the race continues to go south until the marshaled right-hander that has you crossing the highway and put riders on the approach to Nandi. Here, you have to deal with a block headwind, a railway crossing, a series of low speed humps and a false-flat all the way to the base of the climb. Nandi Hills is a double headed climb. The total climb is 7.34 km at around 5%. The first 4 km is the shallower bit to a saddle point where you switch from Nandi I to Nandi II. The last 3 km to the summit of Nandi II is steeper, includes some steep switchbacks and kicks to the finish! 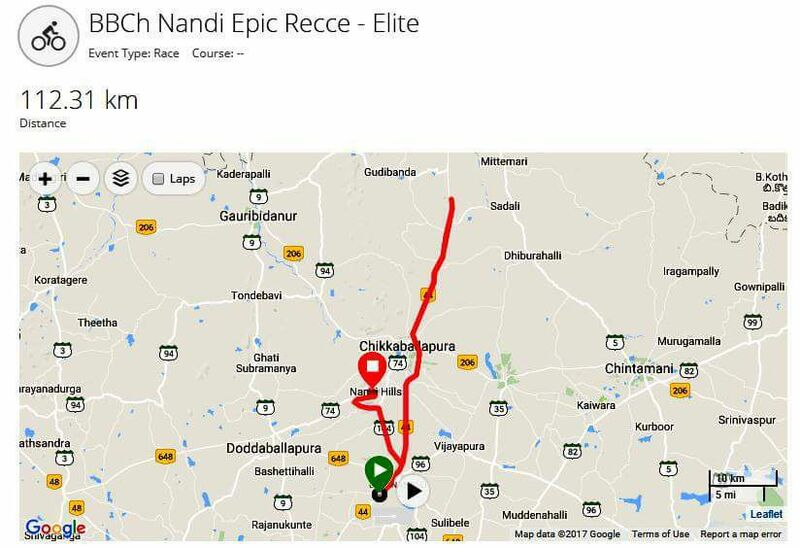 Here’s the route for the Nandi Epic Road Race. The race rolls north on NH-7, past a couple intersections that will be marshaled. After 25.9 km of rolling terrain, some really long flyovers, exposed highway, and south-westerly crosswinds to deal with, and fast highway, to the U-turn point. The U-turn will be marshaled with whistle and will have a neutral feed station. This U-turn is 7.2 km into the Chikkaballapur underpass and take U-turn point under the flyover/underpass. The race continues to go south 20.5km until the marshaled right-hander that has you Nandi crossing the highway and put riders on the approach to Nandi. Here, you have to deal with a block headwind, a railway crossing, a series of low speed humps and a false-flat all the way to the base of the climb. 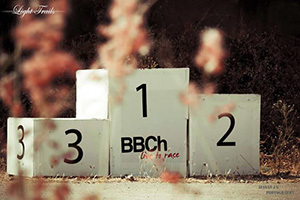 Race Venue / Parking / Registration Desk : Next to CCD and HP Petrol pump - 4 km from International Airport Road toll gate. Start Point : Opp. 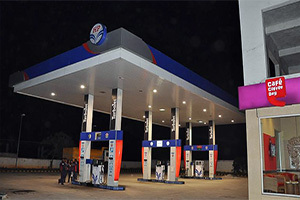 to HP filling station / Cafe Coffee Day (Right side) - 4 km from International Airport Road toll gate. The race rolls north on NH-7, past a couple intersections that will be marshaled. After 25.9 km of rolling terrain the U-turn will be marshaled and will have a neutral feed station for Amateur, Women and U-18. @ 25.9km The U-turn will be marshaled and will have a neutral feed station. @ 48 km Nandi Hill crossing with traffic crossing, take right. @ 58 km take left for Nandi base. @ 61.4 km Nandi base. The race rolls north on NH-7, past a couple intersections that will be marshaled. After 40 km of rolling terrain, some really long flyovers, exposed highway, and south-westerly crosswinds to deal with, the race "descends" 8 km, on straight and fast highway, to the U-turn point. The U-turn will be marshaled and will have a neutral feed station. @ 48.5km The U-turn will be marshaled and will have a neutral feed station. 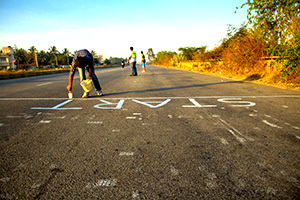 @ 91 km Nandi Hill crossing with traffic crossing from left. @ 101 km take left for Nandi base. @ 105 km Nandi base. 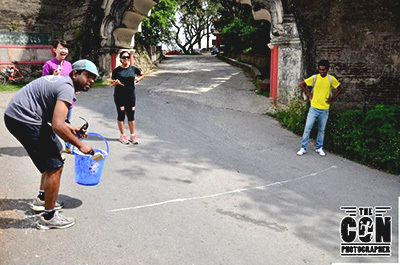 Water and refreshments will be available at the Start point, U-turn, Nandi base and at Finish point.